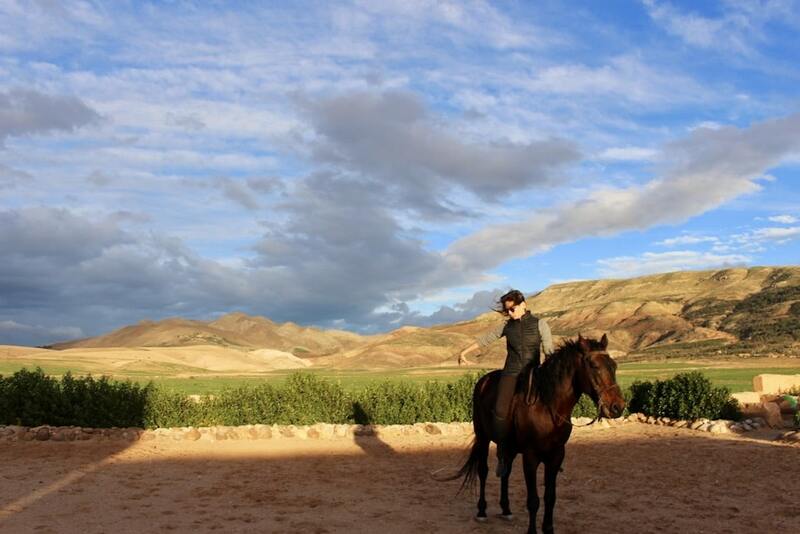 With so many riding options in the Atlas Mountains, I leave it to my Marrakech-based friend and travel blogger to choose for us. 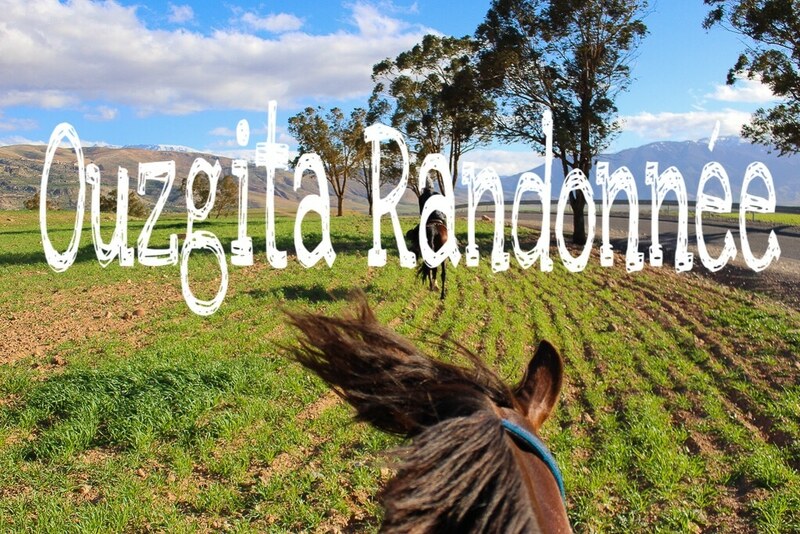 After a week of checking and vetting, she comes up with Ouzgita Randonnée – “best value, best reviews,” she says – and we set off for our equestrian journey. 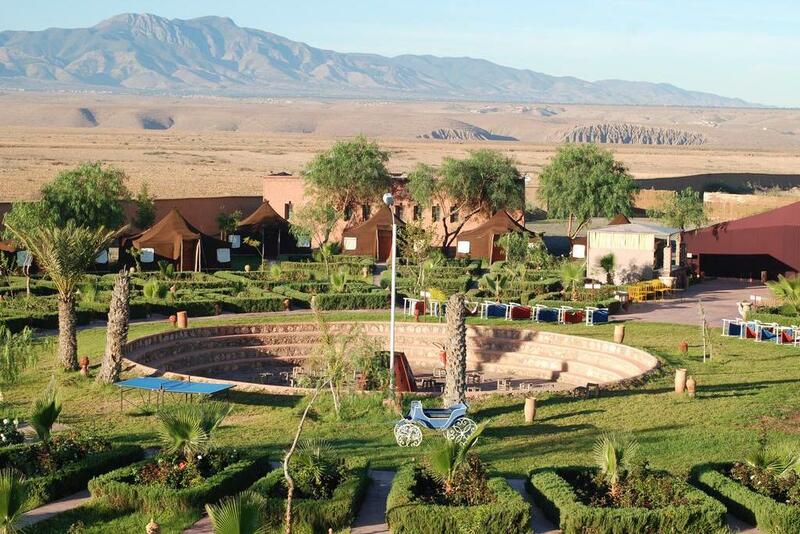 Ouzgita is a ranch bearing the name of the village where it’s located, some 40km away from Marrakech. 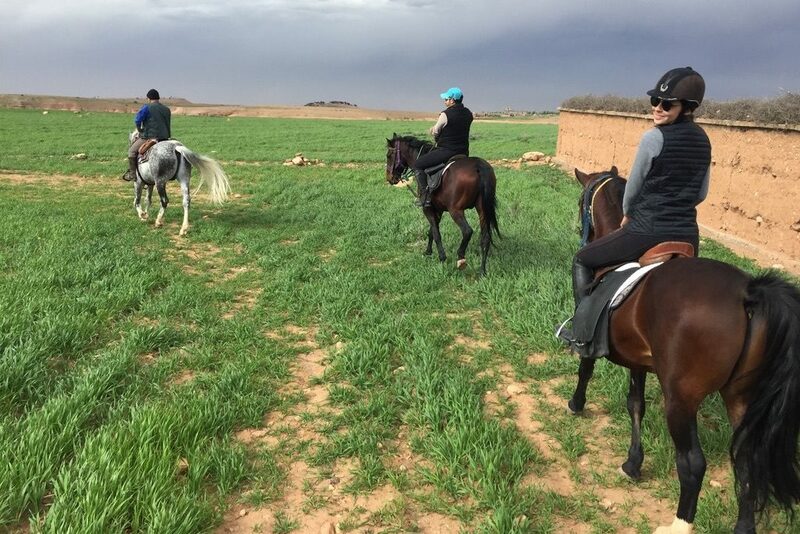 It is managed by a professional equestrian and riding instructor Hassan who makes sure that everyone – complete newbs and seasoned riders alike – have a memorable riding experience. 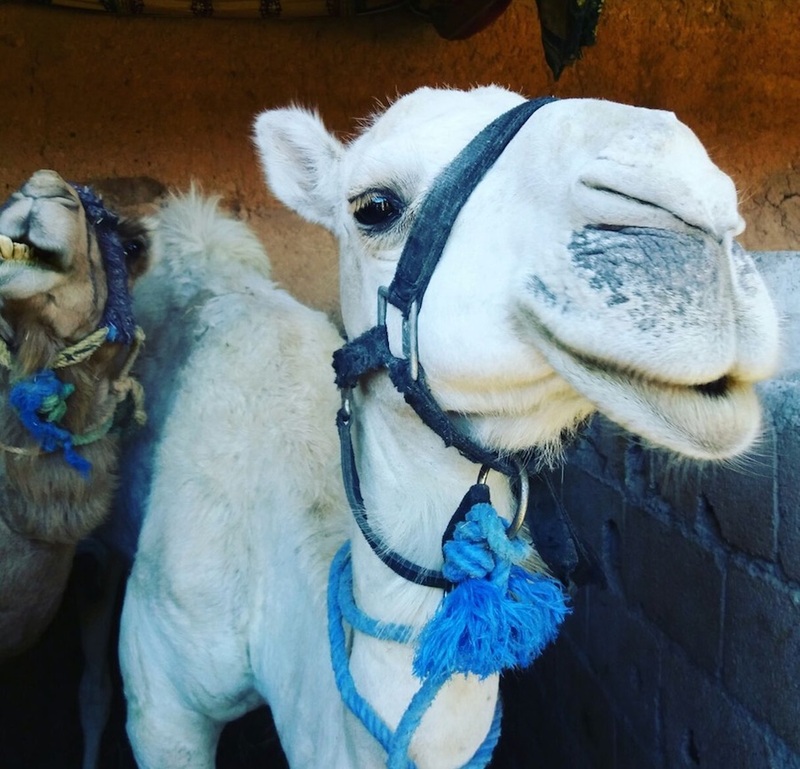 He also offers individual and group tours on dromedaries (one-humped Arabian camels). 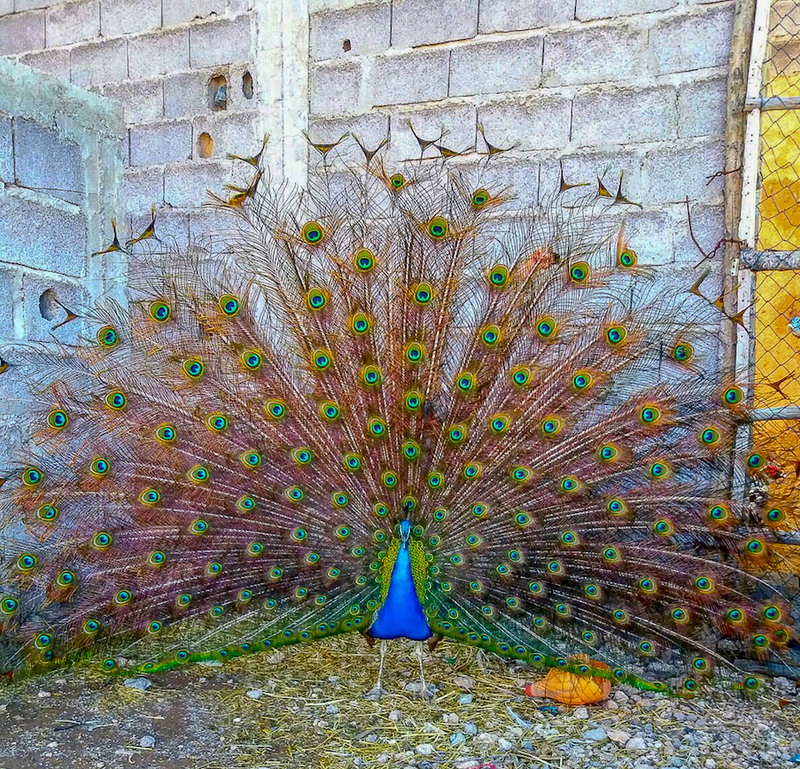 The ranch is home to peacocks, horses, dogs, dromedaries and donkeys, all of whom you get to meet during your visit. 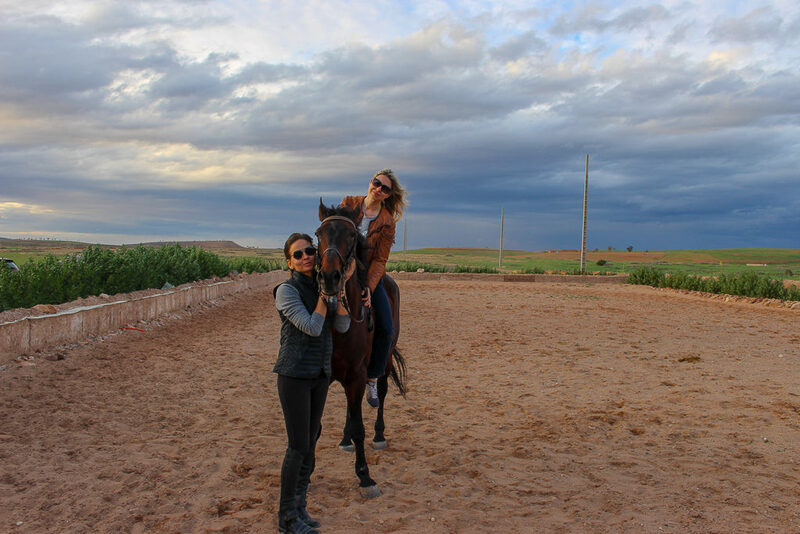 You’ll first meet Ilyes, professional rider and your guide on this journey, who will pick you up at the hotel and drive you to the ranch. 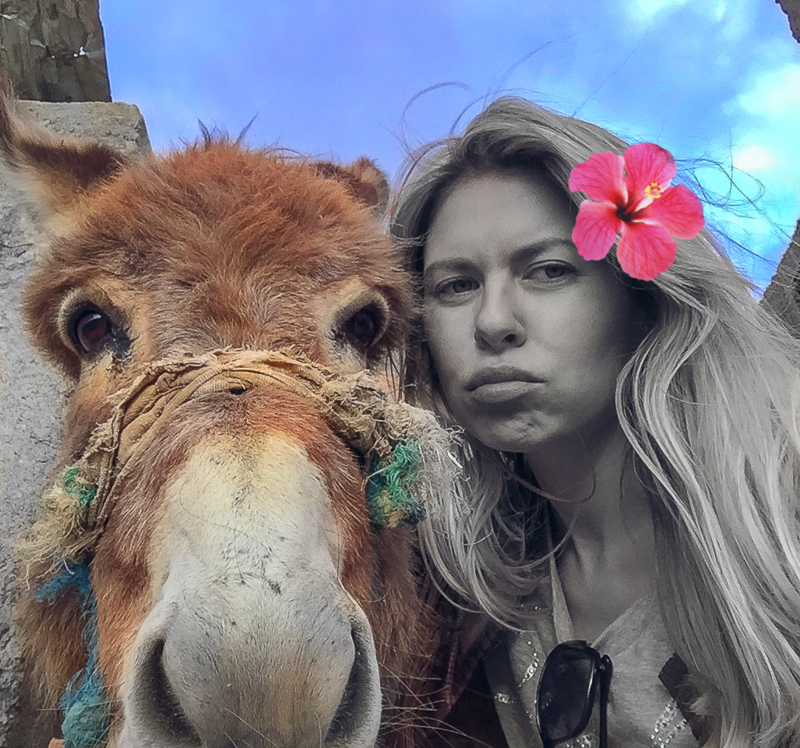 Choose between an English and a Western-style saddle and relax over fresh mint tea, while the Ouzgita team gets your horse ready. Equestrian helmets and chaps will be provided. Your personal items: cameras, sunscreens, etc. will fit into saddlebags. 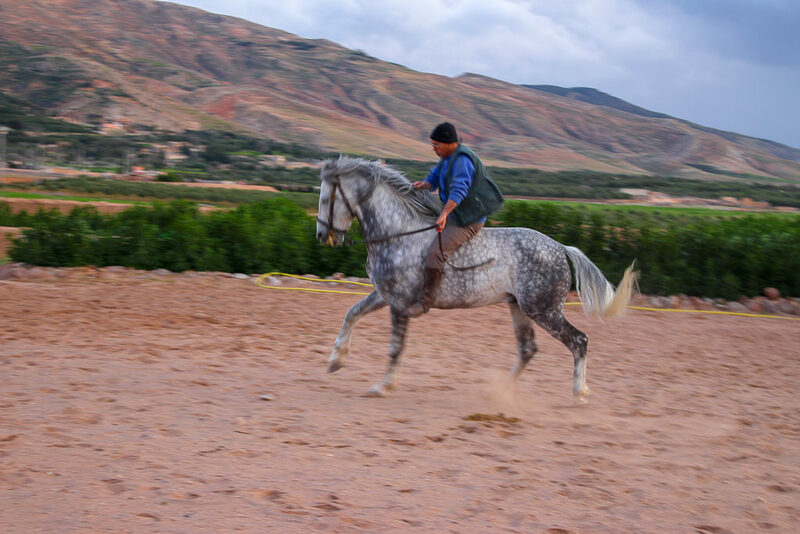 Try out your horse in a riding manège before heading out into the backcountry with Ilyes and Hassan by your side. Expect to stop for lunch in a Berber village or picnic at a scenic place overlooking the mountains and Lake Takerkoust. 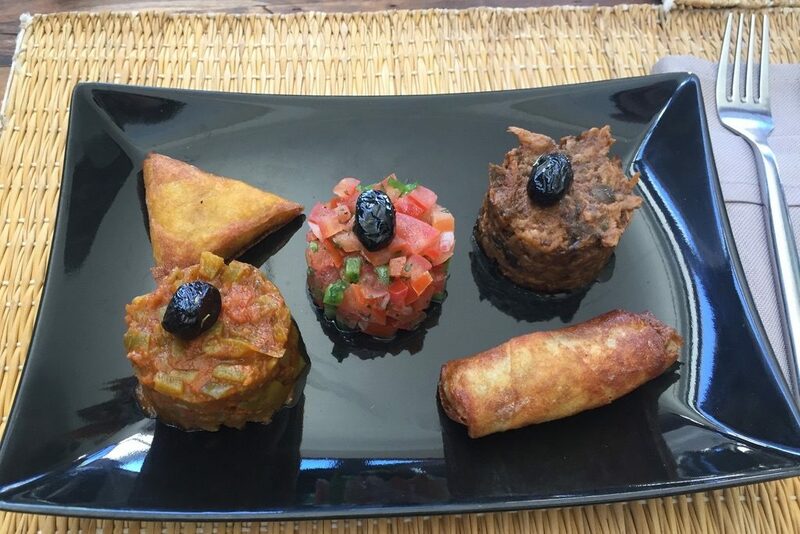 My personal preference is Dar Tifrouine, cozy bed and breakfast with stunning lake views and restaurant specializing in Moroccan fusion cuisine. 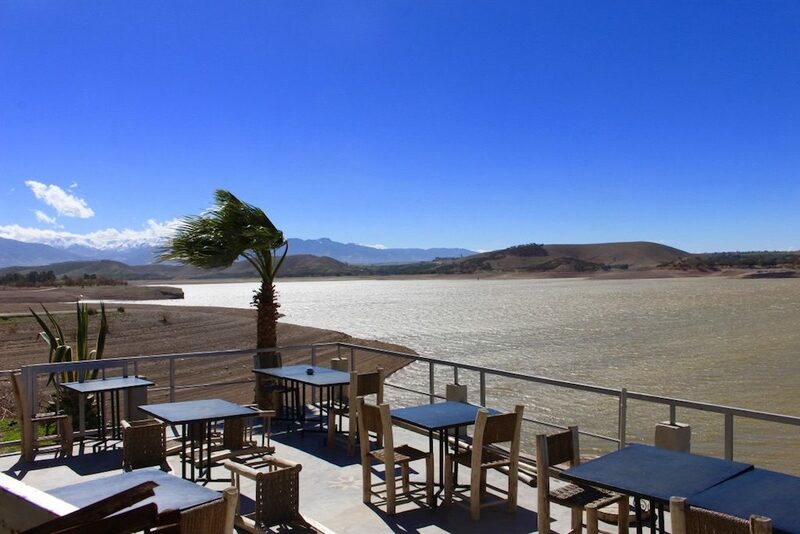 Our two-day itinerary takes us around Lake Takerkoust and the Ouzguita area. 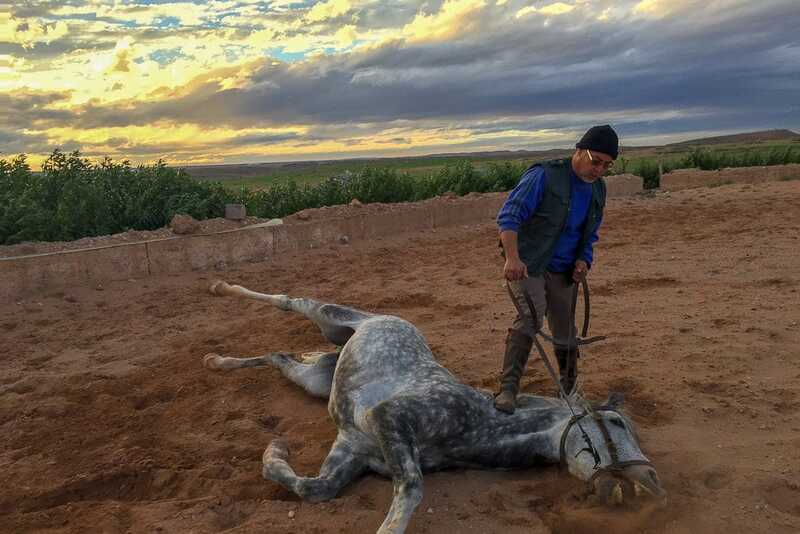 We trek through wheat fields and olive groves, admiring the splattering of bright green against the cobalt backdrop of the High Atlas, climb red rocky paths to high plateaus and descend into lush valleys towards Amazigh enclaves. 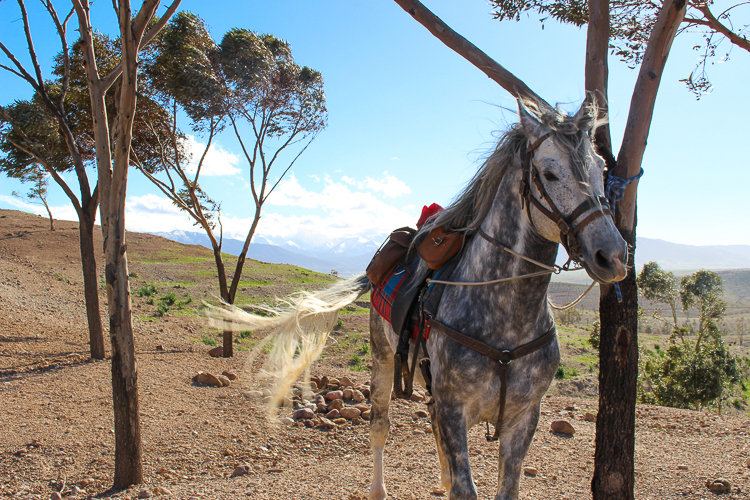 The riding trail takes us through silver eucalyptus forests to the shores of the lake – perfect place to gallop before breaking for lunch in a tiny local village with panoramic views over Takerkoust. We get back just in time to catch the golden hour, literally gaping at the incredible colors of the fields and mountains brought out by the setting sun. 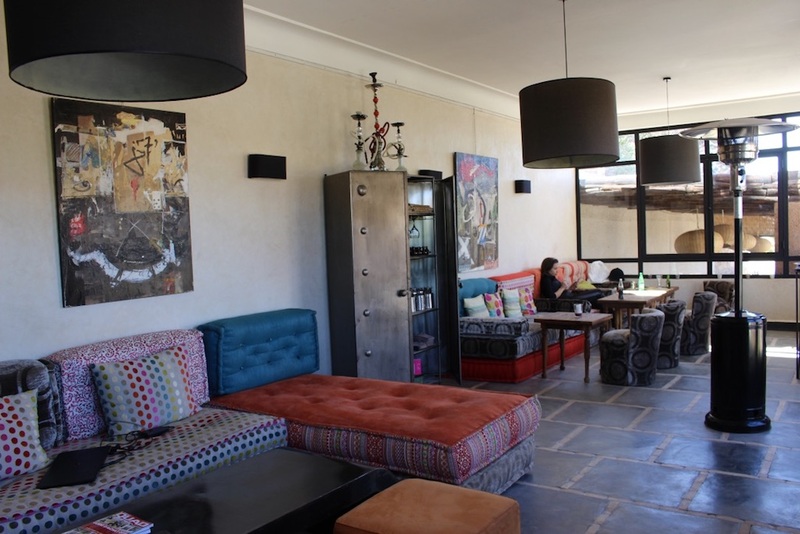 Our dinner is served at Couleurs Berbères, where we also spend the night. 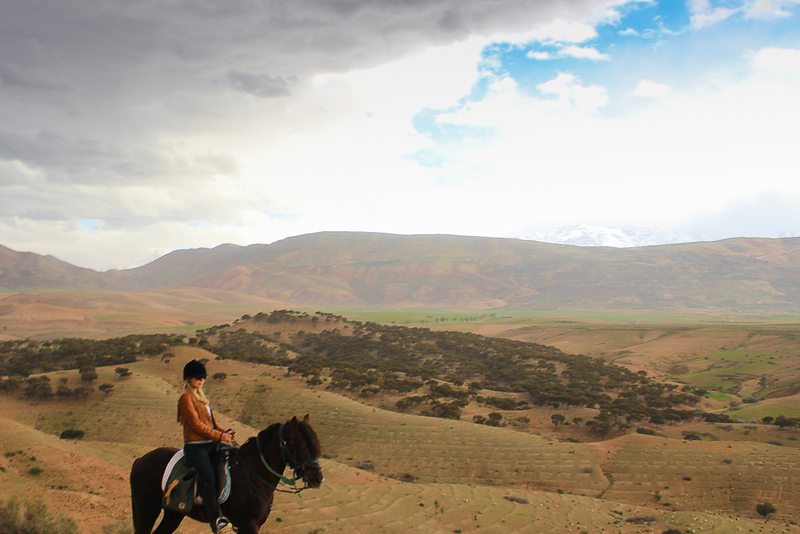 Lake Takerkoust is a scenic route suitable for advanced riders and beginners, which can be completed in one day. 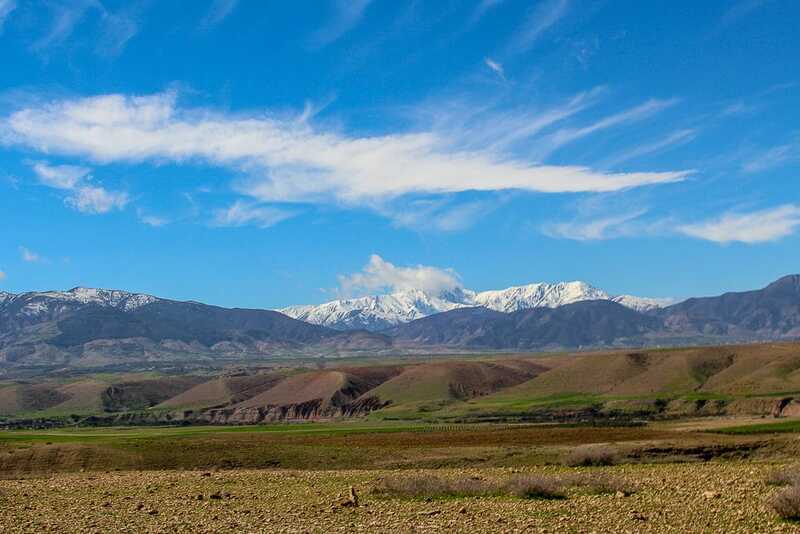 Leave early in the morning and follow the mountain trail towards the Kik Plateau, a limestone outcropping with spectacular views of the High Atlas summits. Enjoy panoramic views of Mount Toubkal and Lake Lalla Takerkoust from above. 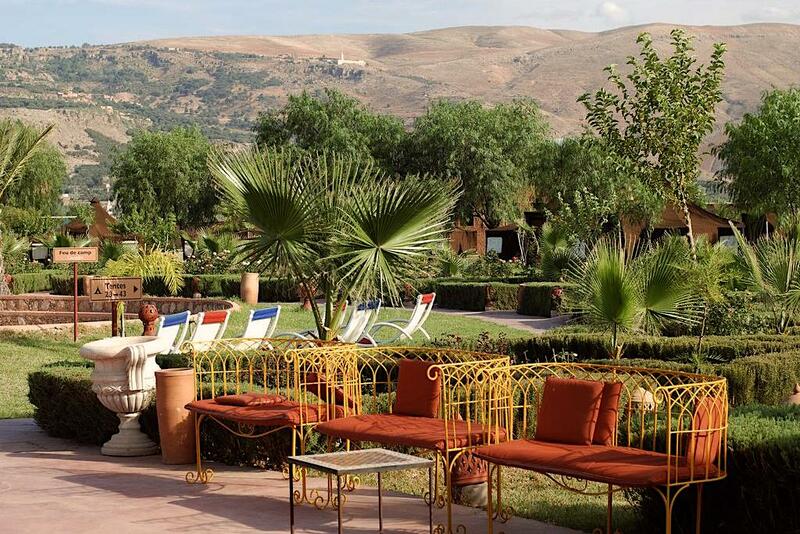 Trek through colorful Amazigh settlements and stop for lunch in one of the traditional restaurants. On the way back, take a different route in the direction of the lake, savoring a 2.5 hour ride through the changing landscape. Leave early and take a scenic route towards Lake Takerkoust. You’ll arrive in a tiny Berber village just in time for lunch. Enjoy your meal over great views and continue in the direction of Agafay. Extending over several hundred hectares, the desert of Agafay is more of a stony and barren plateau, which has an extra-terrestrial feel to it. 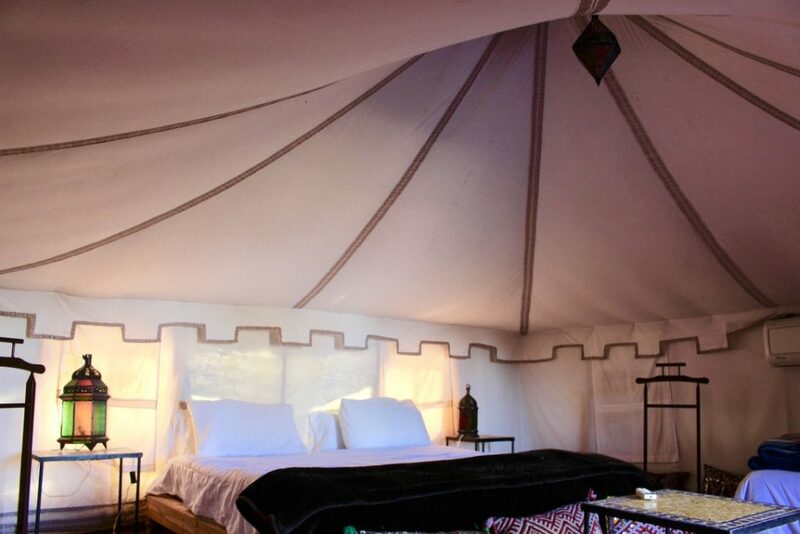 In the midst of this lunar landscape, is a haven of peace and tranquility – a marvelous oasis called “Enchanted.” Spend the night with the oasis inhabitants or stay in an exotic campsite under the starry sky. If you are interested in different terrains or longer trips, your itinerary can be tailored to match your riding skills and aspirations. 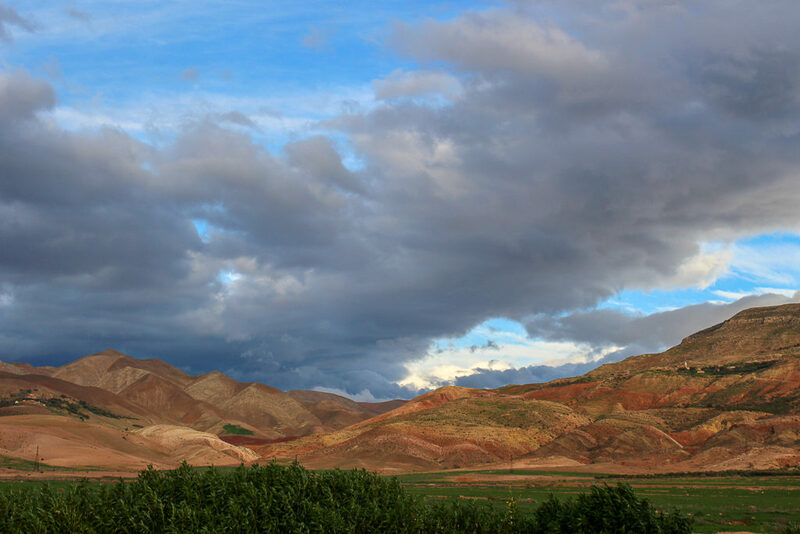 Trek in the mountains, sleep under the open sky, picnic in green valleys and stop in tiny Berber villages. Note that for most mountain terrains you need to be a confident rider. Ouzigita is meticulous about safety checks, ensuring that you have appropriate gear, and enforcing rules while riding. It’s something very basic, but you’d be surprised how many places, including in the US, do not follow the safety guidelines. Experienced guides, attentive instructors and affable companions, Hassan and Ilyes are basically the type of people you want to have with you on a long ride.